Karen is submitting this amazing project that came about because of a problem. 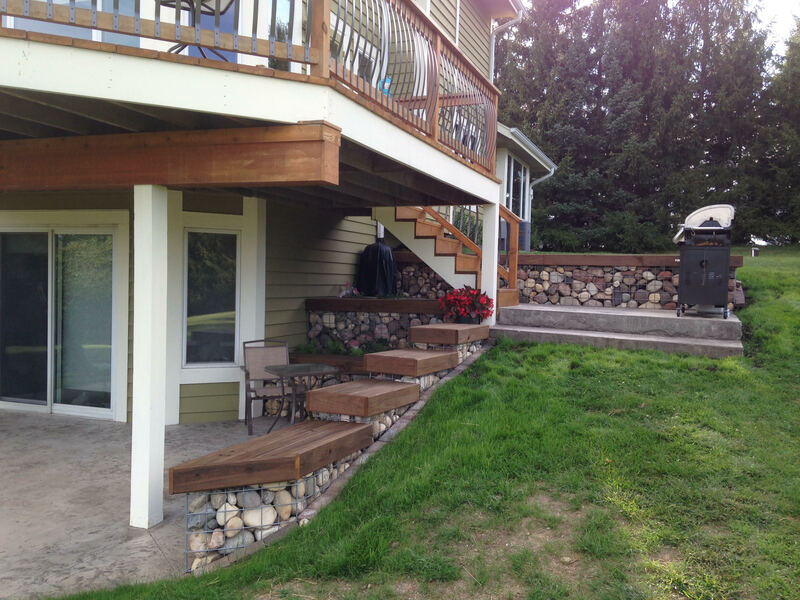 “I solved an ugly slope problem under our deck by designing and making Gabion walls that I then covered with wood caps that I, also, made. I had my husband help with the excavation, lifting the largest rocks, and cutting the metal mesh to my specifications since that is a two person job. 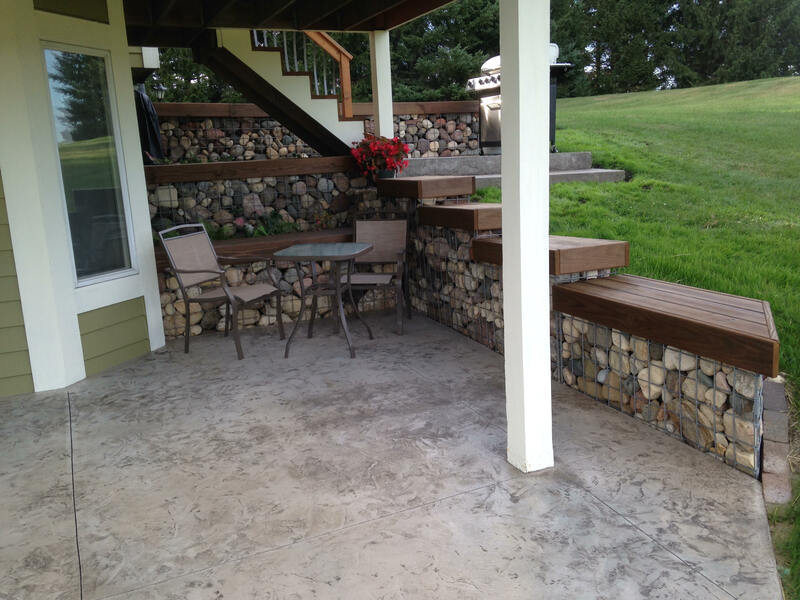 After the walls were in place, we hired a cement contractor to install the stamped/stained patios. I’m very proud of this project. 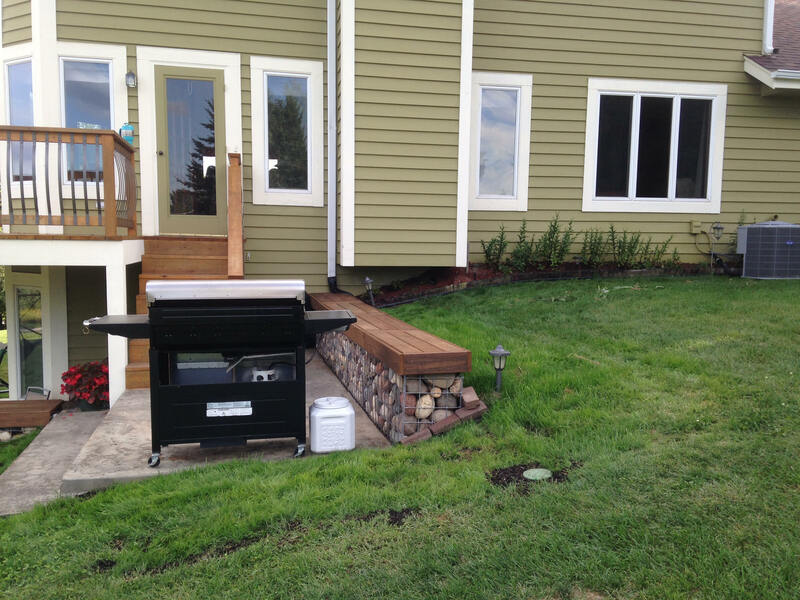 It took a lot of research about gabion walls which are very rare in Wisconsin. Instead of buying precut gabion baskets, I found a metal mesh (galvanized goat/sheep fencing) that I could cut to size. I used hog rings to attach them together instead of the usual spiral wire that they sell for gabion walls…I preferred a cleaner look. I scavenged most of the rocks from our yard, scrubbed and power washed each one, and placed each one by hand in the baskets (reinforcing the baskets with metal cross ties as I went, to prevent bulging). I learned the hard way that this was necessary when I had to remove and rearrange many layers of rocks! I used deck boards to make the wood covers. This was somewhat of a mathematical challenge since they only came in one width. I stained them to march the deck floor.